A brand-new series from #1 bestselling Dork Diaries author Rachel Renee Russell! 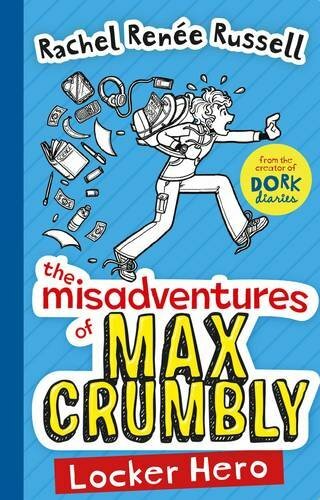 Introducing Max Crumbly, the new Dork on the block... Max is about to face the scariest place he's ever been - South Ridge Middle School! He has been home-schooled by his grandmother until now, and he's begged his parents to finally let him start attending a real school. He's starting to question that choice, though, with the Doug aka Thug Thurston Problem., As in, Thug keeps stuffing Max in his locker. If only Max could be like the hero in all the comics he likes to read - or the ones he draws - and magically escape the locker and defeat Thug. Unfortunately, Max's uncanny, almost superhuman ability to smell pizza from a block away won't exactly save any lives or foil bad guys., But that doesn't mean Max won't do his best to be the hero his school needs!